You can have more than one billing account admin for your account. To add a new billing account admin, you must be a billing account administrator with full management rights. Select Specify who can create applications. In the list, locate the individual you'd like to grant administrative rights. If you don't see the person, click the Add User button	and, in the User Picker that appears,	make your selection. 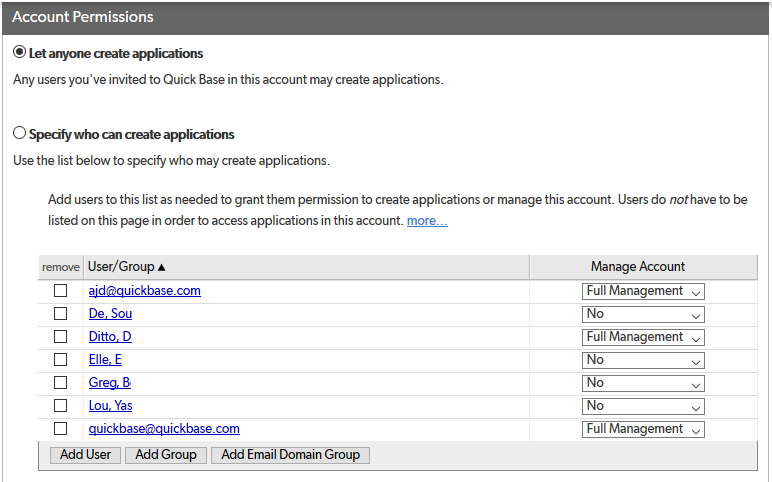 Set Manage Account permissions to Full Management for the user you're granting administrative rights. Tip: If you need to change the primary Billing Account Administrator, click here. Select Support-level if you want to let this person manage most aspects of your account, but do NOT want them to be able to change your billing plan or control administrative access permissions (like the ability to create and control the powers of other administrators as discussed in this topic). Select Full Management if you want to grant the person ALL administrative rights. Doing so gives the user all the abilities and power you have as the Billing Account Administrator. This includes the ability to control your access rights and any other account-level permission settings. Select No to remove access to administrative controls, if you've previously granted the person support-level or full management access.